The University of Texas bestowed a Presidential Citation this week on an evidence-shredding administrator who was instrumental in the secret backdoor admissions program that cost former President Bill Powers his job. Nancy Brazzil, the deputy to UT president Greg Fenves and Powers before him, was named as one of four winners of the award this year. “The Presidential Citations are awarded to the most exceptional friends of our university — the people who invest their time, passion and resources into our students and faculty, so Longhorns can go out and change the world,” Fenves said in a statement. Brazzil ran the backdoor admissions program for Powers. In the Kroll report on the admissions office scandal, her name is mentioned 84 times. Brazzil was the one who placed “Q holds” on the applications of special candidates supported by lawmakers, regents, and wealthy donors. Each year, she placed up to 300 of these holds, which prevented the admissions office from rejecting an unqualified candidate. “In sit-down meetings between the Admissions Director and Nancy Brazzil before the decision deadline each year, Admissions was essentially ‘forced to admit’ many of these applicants over the objection of Admissions, including some applicants who, in this former official’s opinion, clearly did not qualify for admission,” according to the Kroll report. 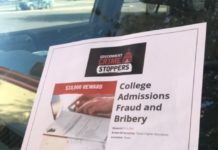 “Because written records or notes of meetings and discussions between the President’s Office and Admissions are not maintained and are typically shredded, it is not known in particular cases why some applicants with sub-par academic credentials were placed on a hold list and eventually admitted,” the report states. According to the report, Brazzil would bring index cards to these meetings, which had notes on must-have applicants, and then later have the cards shredded. In the report, the former dean of the law school, Larry Sager, says that he received 10 to 20 calls a year from Brazzil meant to sway his admissions decisions. Over a six year period, some 2,085 undergraduate applicants to UT received special consideration. The 1719 Texas residents among them were admitted at a rate of 71 percent, compared to a 15.8 percent acceptance rate for Texans going through the competitive admissions process. While Brazzil operated as Powers’ right hand, she also interacted directly with politicians such as former state Rep. Dan Branch and state Sen. Judith Zaffirini, whose influence over education budgets in the Legislature gave them special clout with Brazzil. Next articleWill school districts stop collecting ‘stop-arm’ camera fines? Wow! Scams! She is Trump’s kind of girl! Making America Great! Typical Tee-sip trash. That’s where those UT lawyers learn to be crap.